…and the history goes on! TEAC was originally founded as Tokyo Television Acoustic Company in 1953 (In this year, NHK: Japanese Broadcasting Corporation started television broadcasts in Japan). Later the company changed its name to Tokyo Electro Acoustic Company and then to TEAC. In these early years when “hi-fi” was not a well known word, Tokyo Electro Acoustic Company developed a prototype of 3-motor open-reel tape transport system. In subsequent years TEAC introduced the world’s first open-reel tape deck which had an automatic reverse mechanism. With this innovative product made in Japan the Tape-based hi-fi audio has begun. In the late 1960’s, TEAC introduced their first hi-fi cassette deck model A-20. With this introduction, TEAC was leading new markets for the evolving cassette tape deck hi-fi era. In following few years, TEAC introduced the A-350 cassette deck featuring the Dolby NR system for the first time in Japan. The next introduction in home-use open-reel tape decks was the A-7400RX which included dbx technology – a technology used in professional studio recording. The introduction of A-7400RX made a deep impact in the world’s hi-fi component market at that time. In the early 1980’s, TEAC developed many cassette deck masterpieces with heavy duty, rigid chassis construction. The ZD-7000 was “state of the art,” for this era. TEAC then developed the ZD-5000 CD player incorporating TEAC’s proprietary digital to analog converter, the “ZD circuit”. TEAC continued to introduce stunning hi-fi technologies which were truly evolutionally and accelerated consumers towards “The next level,” of audiophile technologies. In order to bring the highest level musical experience to demanding audiophiles, TEAC launched the “ESOTERIC” brand which exclusively engineered and manufactured high end audio products. ESOTERIC’s first introductions included the P-1 / D-1 separate CD player system and the R-1 DAT recorder. The P-1 was ESOTERIC’s first introduction of the truly unique VRDS (Vibration-free Rigid Disc Clamping System) mechanism attracting serious attention among many true audiophiles of that era. The first decade of ESOTERIC history was a rush of attractive new models; the X-1 CD player, the following X-1s, X-10w, and the upgraded X-10wD. The P-01 CD transport evolved to the P-2, and then to the P-2s. ESOTERIC’s “mechatronics,” technologies were highly enhanced and accumulated, then fed back to engineering development for more new products such as the P-10, the P-30 and the P-50 CD players. ESOTERIC introduced another new and superior CD transport, the legendary P-0 as their 10th Anniversary model. The P-0 featured a unique “Lossless Sled,” optical pickup mechanism providing extremely accurate data retrieval. This ultimate masterpiece was a winner of many famous Japanese magazine awards and was the pinnacle of the CD player scene at that time. 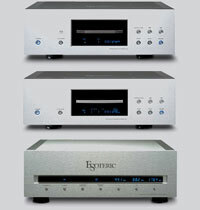 ESOTERIC introduced the X-01 Super Audio CD / CD player and the UX-1 universal DVD player, both featuring VRDS-NEO mechanisms. (The VRDS-NEO is the next generation of VRDS drive mechanisms compatible with Super Audio CD and DVD formats). The X-01 and UX-1 were built with a resonance-free massive chassis. Both are highly acclaimed as pure audio/video source devices, being free from unwanted resonance caused by the high speeds required for Super Audio CD and DVD disc rotation. Also in 2003, ESOTERIC developed the G-0s Rubidium master clock generator. The master clock technology became another representative high end technology of ESOTERIC. “The world’s finest separate digital source playback system designed to meet the challenge of capturing all the potential of the Super Audio CD format” – the reference P-01 / D-01 combination system was born in 2004. The P-01 transport uses ESOTERIC’s highest quality VRDS-NEO mechanism which evolved from the critically acclaimed X-01. To further improve performance, the P-01 is powered by a highly refined separate power supply unit. The D-01 is the world’s first monaural D/A converter system designed for ultimate channel separation and fidelity. This reference source system embodies the complete engineering integration of ESOTERIC’s digital source technologies, The P-01 / D-01 system has become the “benchmark” for digital source systems worldwide. 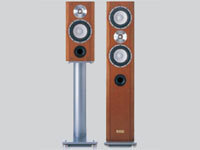 The P-03 / D-03 Super Audio CD separate source system was introduced in 2005. Advanced technology combined the highly acclaimed separate design concepts of the P-01 / D-01, and applied new DSD signal processing technology. The P-03 / D-03 system reproduces highly detailed musical performances surrounded by extreme transparency – right down to the performer’s breath -. The P-03 Universal, a first class universal DVD transport was introduced in the early 2006 to meet the world’s highest level video source playback requirement. In the same year, ESOTERIC produced the “Elegance Series,” consisting of three high tech industrial designs: the SZ-1 Super Audio CD/CD player, the UZ-1 universal disc player, and the AZ-1 digital integrated amplifier master clock combination. The Elegance series is an integration of minimal simplicity and state of art sound technology designed for your enjoyment throughout the 21st century! ESOTERIC developed a new “VOSP” drive mechanism, and introduced the DV-60 / SA-60 digital source players. VOSP (Vertically-aligned Optical Stability Platform), mechanism is another of ESOTERIC’s innovative “leading class” solutions for Super Audio CD/CD and DVD playback. VOSP is equipped with ESOTERIC’s proprietary pickup system enabling ultra stable signal retrieval. The VOSP transport is used in the SZ-1, UZ-1, SA-10, DV-60 and SA-60. VOSP is also supplied on an OEM basis to other manufacturers. In honor of the 20th anniversary, ESOTERIC introduced the SA-10 Super Audio CD/CD player, the AI-10 digital integrated amplifier master clock combination, and the MG-10, MG-20 series speaker systems. ESOTERIC loudspeakers are truly innovative using magnesium diaphragms for both tweeter and woofer cones. This 2007 product range enables ownership for a wider audience of audiophiles without sacrificing quality. For the first time esoteric now provides proprietary technology and premium performance in a full system implementation. ESOTERIC also introduces a new series of components for CD and Super Audio CD audiophile playback: The P-05 / D-05 components, incorporate a completely new VRDS-NEO mechanism model “VMK-5,” and also use the world’s first 32 bit D/A converter technology.